Situated on the Western side of Chobe National Park, Muchenje has a spectacular location overlooking the Caprivi Strip. Exciting safari activities make for a memorable game viewing experience. Muchenje Safari Lodge is a luxury safari lodge in one of Africa's greatest tourist destinations. It is situated on a north facing escarpment in the remote western region of the world famous Chobe National Park in Botswana. 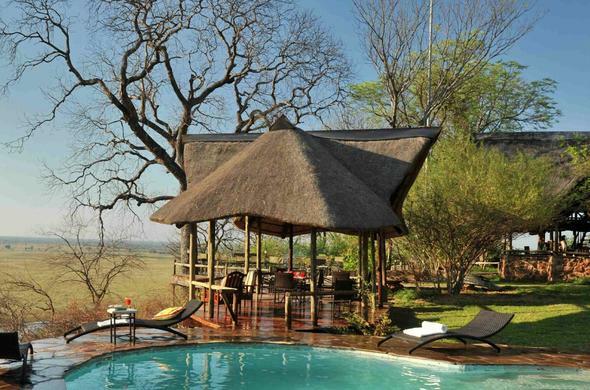 The lodge overlooks the Chobe River and Caprivi floodplain. Muchenje has itself become famous as the place to stay when exploring the wilderness of the Western Chobe. This rustic exterior belies the comforts that wait inside and the warm hospitality of the staff, combined with exceptional game viewing within the Chobe National Park. Muchenje Safari Lodge offers unparalleled safari experiences for both discerning clientele and newcomers to the bush alike. Owner run and managed, attention to detail is paramount with nothing being too much trouble at Muchenje. All visitors should be medically insured, including air evacuation and Malaria protection is mandatory. Tetanus vaccination is recommended. It is advisable to know your blood group type in case of emergencies. Muchenje professional guides are qualified in basic first aid and the lodge does hold a limited supply of Medication. Muchenje has itself become famous for superb access to the wilderness of the Western Chobe and its huge population of wild animals and birds. Chobe National Park is home to the largest herds of Elephant in Africa, and is also known for its large herds of Buffalo.